This post will be about the height of Captain America and the height of the actor who played the role of Steve Rogers, Captain America, in the 2014 movie "Captain America: The Winter Soldier". Did you know that the real Captain America, I mean the one in the books and in the story, was a bit taller than Chris Evans? The real Captain America, Steve Rogers stood 187 cm, according to our height listing about him, the link to the post is posted below. In feet and inches, 187 cm would make Steve Rogers 6 ft 2 in tall. While Chris Evans, the actor who portrayed his role in the movie, is only 184 cm. That would make Chris' 6 ft 0 in tall. So the actor was a bit unqualified in terms of height cause he was a bit shorter to the real one in the book. 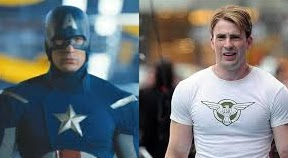 But, that is not the case here, Chris did great in the movie and he looked very nice as Captain America. The movie did great in terms of revenue and everyone is happy. Hope you find this post a little informative guys. The movie Captain America: The Winter Soldier was released in movie theaters in Hollywood last March 13, 2014.